But was it the same town? Were it not for the name engraved all over the station and on the hotels, John might have found a difficulty in believing it. The broad, well-paved streets, with the tram lines laid down the centre, were very different from the narrow winding lanes which he could remember. The spot upon which the station had been built was now the very centre of the town, but in the old days it would have been far out in the fields. In every direction, lines of luxurious villas branched away in streets and crescents bearing names which were new to the exile. Great warehouses, and long rows of shops with glittering fronts, showed him how enormously Brisport had increased in wealth as well as in dimensions. It was only when he came upon the old High Street that John began to feel at home. It was much altered, but still it was recognisable, and some few of the buildings were just as he had left them. There was the place where Fairbairn’s cork works had been. It was now occupied by a great brand-new hotel. And there was the old grey Town Hall. The wanderer turned down beside it, and made his way with eager steps but a sinking heart in the direction of the line of cottages which he used to know so well. It was not difficult for him to find where they had been. The sea at least was as of old, and from it he could tell where the cottages had stood. But alas, where were they now! In their place an imposing crescent of high stone houses reared their tall front to the beach. John walked wearily down past their palatial entrances, feeling heart-sore and despairing, when suddenly a thrill shot through him, followed by a warm glow of excitement and of hope, for, standing a little back from the line, and looking as much out of place as a bumpkin in a ballroom, was an old whitewashed cottage, with wooden porch and walls bright with creeping plants. He rubbed his eyes and stared again, but there it stood with its diamond-paned windows and white muslin curtains, the very same down to the smallest details, as it had been on the day when he last saw it. Brown hair had become white, and fishing hamlets had changed into cities, but busy hands and a faithful heart had kept granny’s cottage unchanged and ready for the wanderer. And now, when he had reached his very haven of rest, John Huxford’s mind became more filled with apprehension than ever, and he came over so deadly sick, that he had to sit down upon one of the beach benches which faced the cottage. An old fisherman was perched at one end of it, smoking his black clay pipe, and he remarked upon the wan face and sad eyes of the stranger. “And why was that?” asked John. “She is blind!” cried John, half rising to his feet. “How is your patient, doctor?” he asked in a trembling voice. “Very bad, very bad,” said the man of medicine pompously. “If she continues to sink she will be in great danger; but if, on the other hand, she takes a turn, it is possible that she may recover,” with which oracular answer he drove away in a cloud of dust. “Can you tell me, my man, if this is where the sick woman is?” he asked. John nodded, and the clergyman passed in, leaving the door half open. The wanderer waited until he had gone into the inner room, and then slipped into the front parlour, where he had spent so many happy hours. All was the same as ever, down to the smallest ornaments, for Mary had been in the habit whenever anything was broken of replacing it with a duplicate, so that there might be no change in the room. He stood irresolute, looking about him, until he heard a woman’s voice from the inner chamber, and stealing to the door he peeped in. The invalid was reclining upon a couch, propped up with pillows, and her face was turned full towards John as he looked round the door. He could have cried out as his eyes rested upon it, for there were Mary’s pale, plain, sweet homely features as smooth and as unchanged as though she were still the half child, half woman, whom he had pressed to his heart on the Brisport quay. Her calm, eventless, unselfish life had left none of those rude traces upon her countenance which are the outward emblems of internal conflict and an unquiet soul. A chaste melancholy had refined and softened her expression, and her loss of sight had been compensated for by that placidity which comes upon the faces of the blind. With her silvery hair peeping out beneath her snow-white cap, and a bright smile upon her sympathetic face, she was the old Mary improved and developed, with something ethereal and angelic superadded. Now John listened quietly to all this from behind the door, and more than once he had to put his hand to his throat, but when she had finished, and when he thought of her long, blameless, innocent life, and saw the dear face looking straight at him, and yet unable to see him, it became too much for his manhood, and he burst out into an irrepressible choking sob which shook his very frame. And then occurred a strange thing, for though he had spoken no word, the old woman stretched out her arms to him, and cried, “Oh, Johnny, Johnny! Oh dear, dear Johnny, you have come back to me again,” and before the parson could at all understand what had happened, those two faithful lovers were in each other’s arms, weeping over each other, and patting each other’s silvery heads, with their hearts so full of joy that it almost compensated for all that weary fifty years of waiting. It is hard to say how long they rejoiced together. It seemed a very short time to them and a very long one to the reverend gentleman, who was thinking at last of stealing away, when Mary recollected his presence and the courtesy which was due to him. “My heart is full of joy, sir,” she said; “it is God’s will that I should not see my Johnny, but I can call his image up as clear as if I had my eyes. Now stand up, John, and I will let the gentleman see how well I remember you. He is as tall, sir, as the second shelf, as straight as an arrow, his face brown, and his eyes bright and clear. His hair is well-nigh black, and his moustache the same—I shouldn’t wonder if he had whiskers as well by this time. Now, sir, don’t you think I can do without my sight?” The clergyman listened to her description, and looking at the battered, white-haired man before him, he hardly knew whether to laugh or to cry. 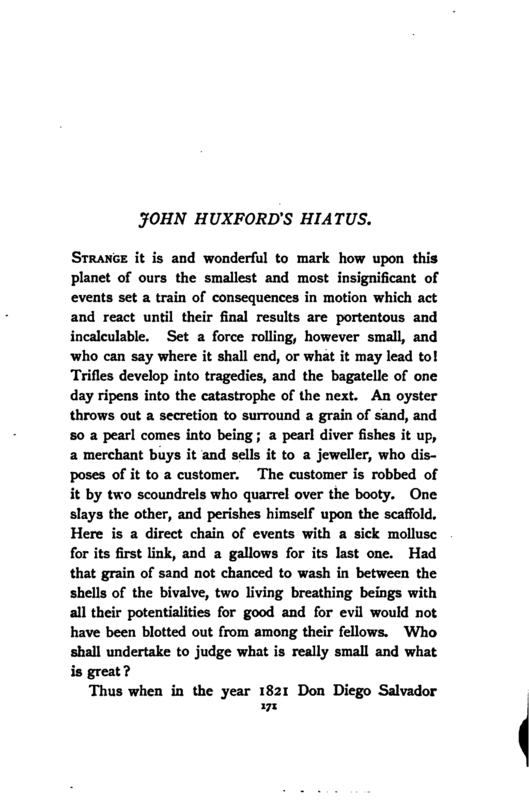 John’s share in the Quebec business was sold out, and gave rise to a very interesting legal question as to whether, knowing that his name was Huxford, he could still sign that of Hardy, as was necessary for the completion of the business. It was decided, however, that on his producing two trustworthy witnesses to his identity all would be right, so the property was duly realised and produced a very handsome fortune. Part of this John devoted to building a pretty villa just outside Brisport, and the heart of the proprietor of Beach Terrace leaped within him when he learned that the cottage was at last to be abandoned, and that it would no longer break the symmetry and impair the effect of his row of aristocratic mansions.